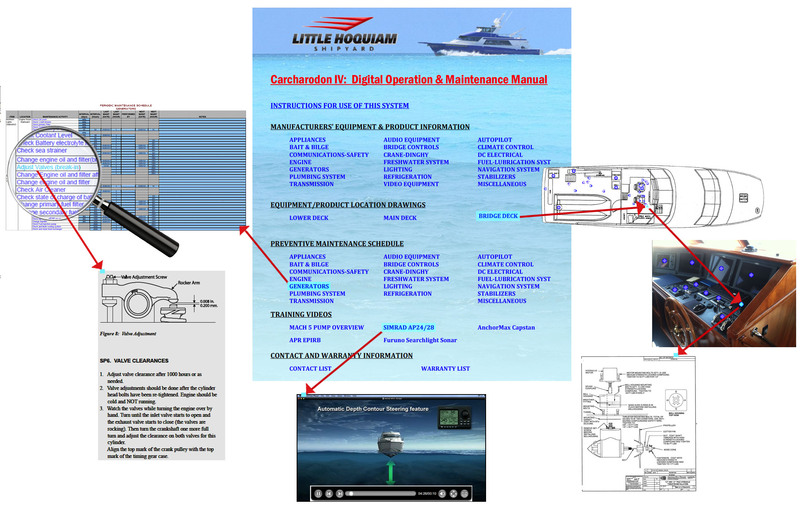 Original manufacturer’s manuals are included for every piece of equipment on the vessel. All documentation is fully searchable – do text searches of individual manuals of the entire set. “Web-style”, “point and click” navigation allows quick “drill-down” to required information, generally in less than one minute. No learning curve for anyone who has “surfed” the internet. Interactive ship’s deck plans with “pop-up” photos allow point-and-click navigation to equipment manufacturer’s manuals from location where equipment is shown on plan or visible in photos. Graphic of deck plan illustrating click opening photo and opening manual from photo. Photographic survey of ship: We conduct a comprehensive deck-by-deck photo survey of the entire vessel. Links to the photos are placed on the deck plan at the location from which the photo was taken. The user simply “clicks” on the camera symbol to view the selected photo. Photos aid in visualization of ship layout, particularly for engineers in off-ship locations. The manual contains a compiled list of all manufacturer recommended preventive maintenance activities for each piece of equipment. Equipment is organized into groups by systems. The list is interactive allowing the maintenance technician to enter dates or hour-readings that an activity is performed, name of technician and service related comments. If the manufacturer’s manual includes a procedure for a maintenance activity there is a hyper-link from the activity list to the appropriate page in the equipment manual. A compiled list of manufacturer’s warranties is provided with hyperlinks from the list to each warranty document and contact information for warranty service. A user editable Contact List is provided for quick access to phone numbers, addresses, websites and e-mail addresses of equipment and service vendors, emergency contacts and any others that may be useful for routine or emergency assistance. New contact entries can be made by manual users at any time. O&M Tech offers optional QR code tagging of equipment, which will allow Maintenance Technicians to automatically access the maintenance records and maintenance procedures for the equipment by scanning the tag with an iPad.